A scene from the crowded Za'atri refugee camp in Jordan hosting many Syrian refugees. Gravely concerned by the deepening “humanitarian tragedy” in Syria, the United Nations Security Council today urged the Syrian Government to immediately allow cross-border aid deliveries and called on all parties to the conflict to agree on humanitarian pauses in the fighting, including along “key routes” for relief convoys. “The magnitude of the humanitarian tragedy caused by the conflict in Syria requires immediate action to facilitate safe and unhindered delivery of humanitarian assistance” across the entire country, the 15-member body said in a presidential statement which also deplored the escalating violence that has already killed more than 100,000 people and driven some 6.5 million others from their homes. The Council condemned widespread violations of human rights and international humanitarian law by the Syrian authorities, as well by armed groups and called on all parties to immediately end such violations in a country that has been torn apart by increasingly brutal violence since opposition protesters first sought the ouster of President Bashar al-Assad in March, 2011. “The Security Council recalls that all obligations under international humanitarian law must be respected in all circumstances,” it added in the statement, which called on all sides to immediately end all violence and attend a peace conference to facilitate a Syrian-led political process leading to a transition that meets the legitimate aspirations of the Syrian people. The Council said it was “appalled” by the level of violence, including sexual and gender-based abuse, condemned increased terrorist attacks, and called for immediate action to facilitate safe and unhindered delivery of humanitarian assistance in the whole country, stressing that the Syrian authorities bear the primary responsibility to protect their populations. It expressed appreciation for the significant efforts made by the neighbouring and regional countries, notably Jordan, Lebanon, Turkey, Iraq and Egypt, to accommodate the more than two million refugees who have fled Syria. 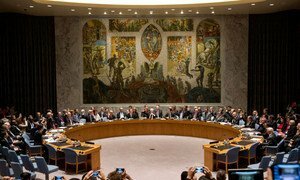 “The Security Council also urges all Member States to respond swiftly to the United Nations’ humanitarian appeals to meet the spiralling needs of people inside Syria, in particular internally displaced persons, and Syrian refugees in neighbouring countries, and to ensure that all pledges are honoured in full,” the statement declared. “I and my colleagues in the humanitarian and human rights fields have called many times over the past two and a half years for unhindered access to help us get aid to people in desperate need, many of whom are in areas we have not been able to reach for months,” Ms. Amos said, adding that humanitarian actors have also called on the warring parties to protect civilians from the brutal fighting and violence - to stop targeting vital civilian services like schools, shops and hospitals, and to stop violating human rights. “We have also continued to ask for increased support to the millions of families who have fled to neighbouring countries and for the communities supporting them,” Ms. Amos said, also emphasizing that people must be able to seek safety from the violence and know that their homes, hospitals and schools are safe. UN Secretary-General Ban Ki-moon also welcomed the Council’s statement, which he said illustrates the commitment of the international community to support the people caught up in the Syrian crisis. “The Secretary-General notes that if the commitments and practical steps outlined in the statement are implemented, humanitarian workers will be able to reach millions of Syrians in desperate need, many of whom have been unreachable for months,” according to a statement issues by the UN chief’s spokesperson in New York. The Secretary-General also emphasised that the Security Council clearly calls on all parties to the conflict to do their utmost to end the violence in Syria, reminds them that they must facilitate the swift provision of vital humanitarian aid and underscores the serious consequences of violating international humanitarian and human rights law.